I have been a Rachel Ashwell fan from the very beginning of her design career. Back in 1989, Rachel made us fall in love with the Shabby Chic look, from those plump white slip-covered sofas, to the flowered pastel fabrics and flea market china. Her style has always radiated beauty, comfort and charm. 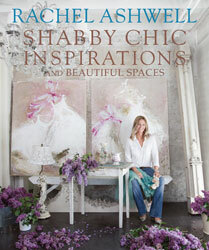 Rachel Ashwell's Shabby Chic Inspirations is Rachael's newest book. Like her previous six books, this one is also filled with stunning photographs of gorgeous houses and rooms. This book is a little more Bohemian inspired than the previous ones, but it is still pure Rachel Ashwell. Her signature tattered elegance and faded beauty are visible in every room, from Malibu to London. Each home featured in the book is of course beautiful, but actually feels very much like a peak into the lives of it's owners. We get to see a surprisingly simple but lovely barn in Malibu that is home to a young couple and their three children. Sharon and Ozzy Osbourne's California house is stunning with it's glamorous yet cozy interiors. There is even a very tiny houseboat in London that is so charming, it's size hardly matters. All of the homes featured here, regardless of size or location, share a common theme. Appreciation of beauty, a love of timeless treasures, and a comfort to one's soul. Once again Rachel Ashwell inspires us with her vision of how to make a beautiful home. You can purchase Rachel Ashwell Shabby Chic Inspirations from the publisher's website Ryland Peters & Small and other book stores. You can connect with the publisher to learn more about Rachel Aswell's books and find other great books publisher by them online at facebook and twitter.